Le Dernier Appel by Marrugeku. Photography by Prudence Upton. A more familiar metaphor might be our sudden recognition in a child’s gesture that she or he takes after one of their grandparents and not their more immediate forebears. Consciously or unconsciously, we carry ghosts with us and those ghosts can go back a long way. We grow out of the dead. A press release announces Le Dernier Appel as “an inter-cultural and trans-Indigenous production, featuring Australian and New Caledonian dancers of First Nations, immigrant and settler descent.” But you will not need to have read the press release or a write-up like this to get that information or any associated messages. This is because the message of the performance is writ forcefully all over it, glowing from a giant iPhone screen that offers up news footage with a fast-scrolling text feed, as well as a steady array of colonial portraits and contemporary decolonization protest images that accelerate into a red-rushing, subliminal pile up. The spark for the work is a referendum on independence from France due in New Caledonia in November 2018. This information is detailed in the news ticker that cross-cuts items with an overlapping news conversation on Australia’s tussle with the words for an Indigenous recognition in the Constitution. Just as you begin to tire of the information overload and wrestle your gaze more fully towards the dancers, accepting you can’t keep up with the speed and density of the written information anyway, this textual and polemical bombardment ceases. By then the dancers are in full flight. Apart from the giant iPhone (which also offers a serene close-up of geometrically composed leaves that slowly turn blood red, and later use as a mirror and a solitary source of reflected light), the only other pieces of staging are a long, harsh metal bench that reminds one of an extended and cruelly uncomfortable chaise lounge, and a rock with what appears to be radial totemic markings. 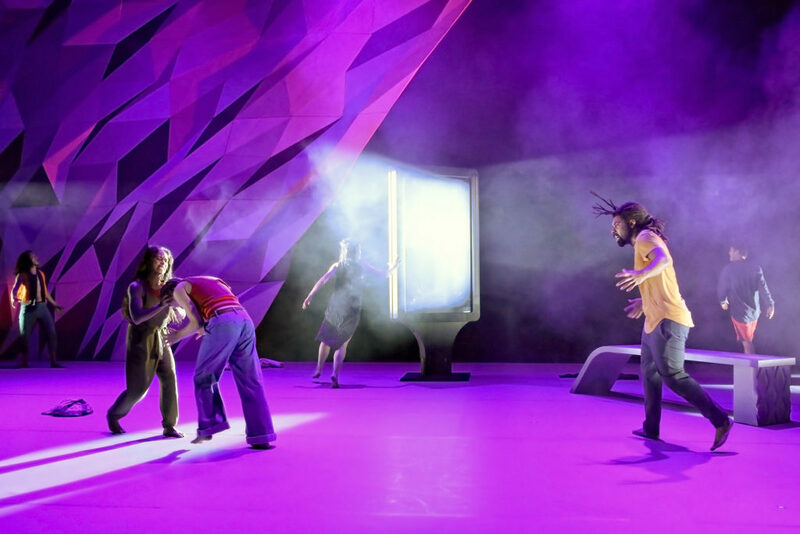 The six dancers are as advertised – a mix of Australian and New Caledonian presences, white, black, Asian, dressed casually yet distinctively in everyday clothes – moving with a looseness that suggests, at times, about as much choreography as the bustle of a busy street. And yet this was a very, very powerful collective expression. And though each dancer was able to maximise their individual identity and style, the motion and interlocking weave and action held all the tension and danger of an MMA cage fight. Faint traces of hip hop moves, ballet training and indigenous dance rituals existed in a performance of stunning gymnastic force. You really felt these people were dancing for their lives. Or if not quite that, fighting to understand who they were – part liberation struggle, part exorcism. Inherent in their youth and physical vitality one might also have read some hint of a new democracy being born. 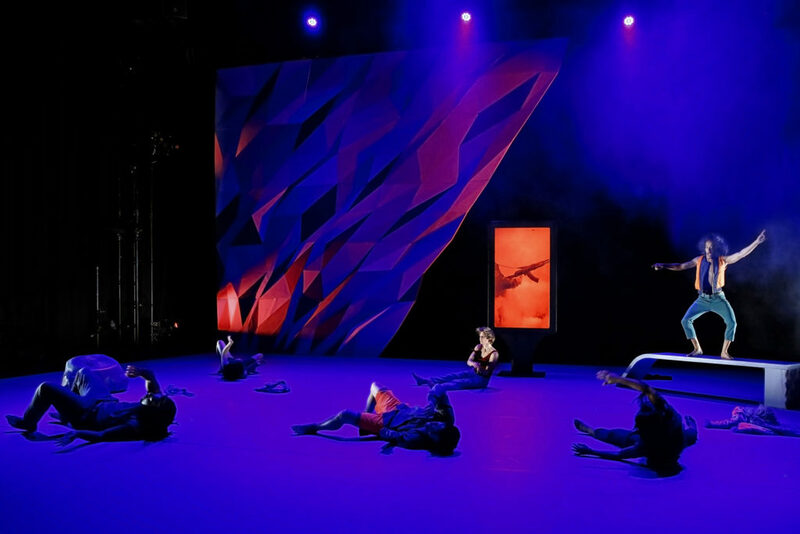 In one incredibly impressive sequence, a dancer wiped his hand across his face and thereby his identity away, falling backwards almost to the floor, rolling over and around without ever seeming to actually fall and touch the ground. He then arched himself back to standing height before wiping his face and repeating this shoulder-rolling, downward-falling, gravity-defying move again and again, spinning almost drunkenly in a circle of his own terrible making. Elsewhere dancers distinguished themselves with even the smallest of gestures as much as more dramatic feats, twitching and jittering, then exploding from themselves. This was an exceptional collective, with each dancer pulling us toward and even into them. Any relationship between dance and language is obviously problematic, especially when that language is so freighted in politics. Reviewing a production like this can be just as difficult; to rephrase an old joke, writing about dance is like singing about architecture. And yet dance and narrative do connect, perhaps as something nearer poetry than prose – a form of storytelling that can border on the shamanistic at its best. Dance, like song and poetry, talks to some other deep part of us. Le Dernier Appel, The Last Cry, achieved that shamanistic point of flight amid its messaging. Despite its highly contemporary shape, (Dis)Information Age references and radical polemic, it warrants a much older reference: to the Ghost Dance of the Native Americans, a latter-day spiritual uprising of the nineteenth century that sought to unite the living with the dead in order to drive away the white colonists. 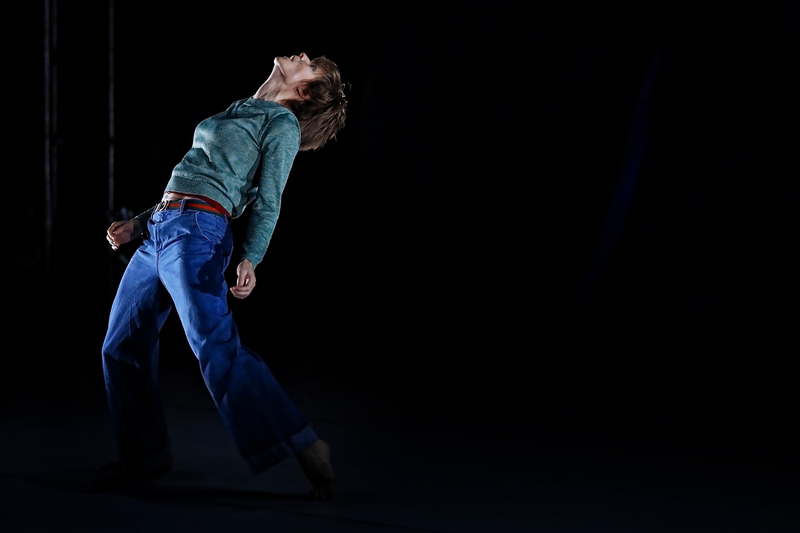 At Le Dernier Appel’s end, the dancers moved forward, in step together at last, towards a ray of light, their arms outstretched – as if to either embrace or receive something, it’s not clear. Each person who sees this show will likely feel a final message of hope or pessimism in that moment. A fatal echo of the colonial past being met again; or a step towards a better world. Le Dernier Appel is at Carriageworks, 8pm Wednesday to Saturday, 15-18 August 2018.